Apartment 101, my full evening close-up magic show. The St. Paul Pioneer Press article. Click on photo. "Mr. Carlson has proven to be a major asset to our entertainment program. Guests at our Camelot restaurant absolutely 'Adore' his fabulous personality and phenomenal 'Magic' performed table-side to 'Entrance our Guests!' I am going to truly miss Steve and, can only say that anyone that employs him will inherit a professional this﻿﻿ is so rare in our industry!" "Beautiful work on your websites. Outstanding talent. I think you should rightly be world-famous, of course I am just your mother." 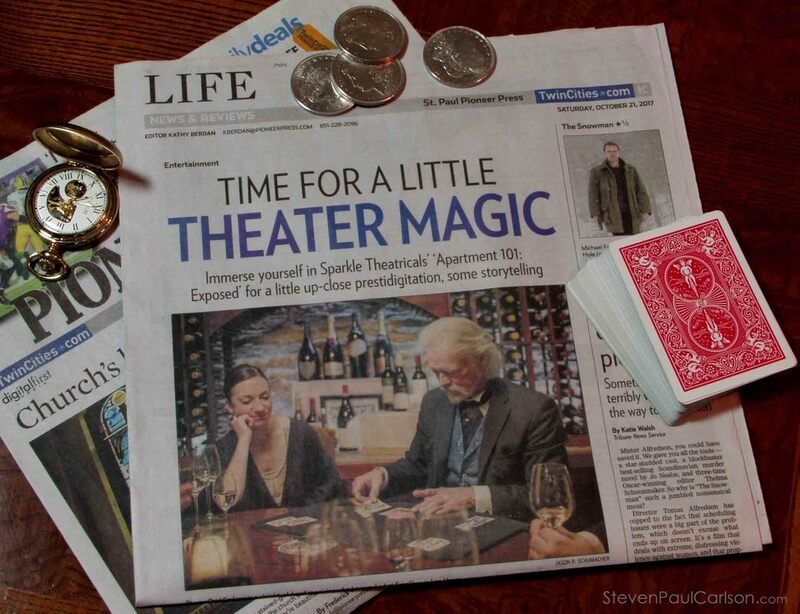 If magic is what you’re looking for, be sure to catch Steven Paul Carlson. His card tricks and sleight-of-hand are smooth enough to make silkworms jealous. Picking an unsuspecting member of the audience to join him onstage, Carlson instructs the newly found assistant to cut a length of thread several times. Carlson then gathers the loose pieces into the palm of his hand, making a tangled ball of thread. He hands the ball to his “assistant”, who pulls it apart, revealing that the loose end is now a single strand of thread. When not on stage, Carlson can be found tableside at one of the restaurants located on the second floor of Excalibur. In this close-up setting, he’s at his best. One of Carlson’s card tricks is the shuffling of four royal flushes out of a 52-card deck with one hand. In another he has a customer pick a card at random and write it down on a well-concealed piece of paper. At the end of the trick, Carlson correctly guesses the card every time. Customers can get brain cramps if their skepticism gets the best of them. Carlson has found his magical niche at the Excalibur and he plans to add a mirror above his act so the audience can have a bird’s-eye view of his card tricks. On one of our sojourns to the Las Vegas Strip, we ducked into the Excalibur, because we had heard a rumor that there was a magical entertainer quietly performing in the Camelot Restaurant, without much publicity or to do about him. So I slipped into the Lounge with Doty Davis, our photographer, and discovered a charming young man performing sleight of hand, utterly unbelievable smooth transitions with cards, coins, balls and brass cups. His magic is close up, and the tricks are totally undetectable… believe me, we were eye to eye with him and couldn’t figure out how he did these amazing feats… His name is Steven Paul Carlson, and he’s wonderful. Incidentally, I understand the food is top Gourmet quality, too, so I’d consider and evening at “Camelot” HOT!